WASHINGTON (CNS) – Pope Francis has appointed Auxiliary Bishop Robert J. Brennan of Rockville Centre to be the new bishop of Columbus, Ohio. The appointment of Bishop Brennan and the resignation of Bishop Frederick F. Campbell, 75, who had led the Diocese of Columbus since 2004, were announced Jan. 31 in Washington by Archbishop Christophe Pierre, apostolic nuncio to the United States. Ordained a priest of Rockville Centre in 1989, Bishop Brennan, 56, had served as its auxiliary bishop since 2012. Born June 7, 1962, in the Bronx, he attended St. John’s University, Jamaica, Queens, where he earned his undergraduate degree in mathematics. He earned his master of divinity degree from the Seminary of the Immaculate Conception in Huntington, L.I. He has served at the Church of St. Patrick and as secretary to the late Bishop John R. McGann, the late Bishop James T. McHugh and Bishop William F. Murphy. He was vicar general and moderator of the curia and pastor of the Church of St. Mary of the Isle. He also has been a member of the board of directors for Catholic Health Services of Long Island, a member of the bishop’s advisory Committee for Catholic Education and a chaplain for the Catholic Lawyers Guild of Nassau County. Bishop Campbell was ordained a priest in 1980. 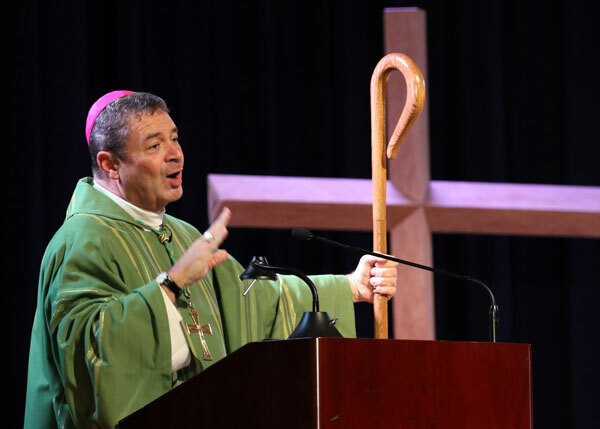 He served as an auxiliary bishop of the Diocese of St. Paul and Minneapolis from 1999 to 2004 and became the 11th bishop of the Diocese of Columbus in 2004.